For the past few years, I've been afflicted with some serious arthritis in my knees and lower back. I've had cortisone shots in my back and knee and electric nerve blocks in my back and left knee. I've been taking way too much medicine to combat the nerve pain I have that runs from the lower center of my back down to my legs and feet. Lately the inflammation I've been feeling seems to be worsening. The new general practitioner I see suggested that I start on an elimination diet, removing foods, dairy, meats, eggs, and wheat that might be triggering my flare-ups. It's also a way to re-start my system and to get me back to a cleaner eating pattern. The doctor told me to start the elimination diet a week ago, but it's not something you can just start without planning: shopping, cooking and lots of studying. I couldn't just jump into the plan as we have a crazy couple of weeks ahead of us at home. The boy is an "extra" or "super" in Opera Philadelphia's production of Elixir of Love. Which means we are out almost every night of the week and Saturday mornings for rehearsals. By the time I could plan, shop, study and cook, it was Sunday. The diet started today - Monday. 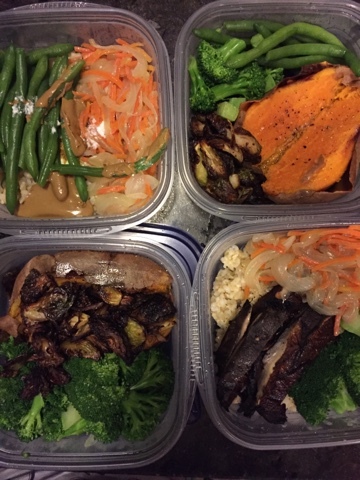 Last night I cooked up a lot of clean food - steamed broccoli and string beans; roasted brussel sprouts; sauted Vidalia onions and carrots; quinoa for a breakfast quinoa porridge; grilled portobella mushrooms; grilled chicken breast; a pot of short-grain brown rice; roasted sweet potatoes. I'm so glad I can have some carbs like rice, quinoa, millet, flax and potatoes. I have to avoid sugars, peanuts, and soy products. The hardest thing to eliminate for me so far - caffeine. Giving up coffee and black tea is going to be a slow withdrawal I fear. If you fail to plan you''ll plan to fail. I'm happy to report I do have my lunch for this week sorted. I bought entree containers and made my 4-day week's worth of lunch. 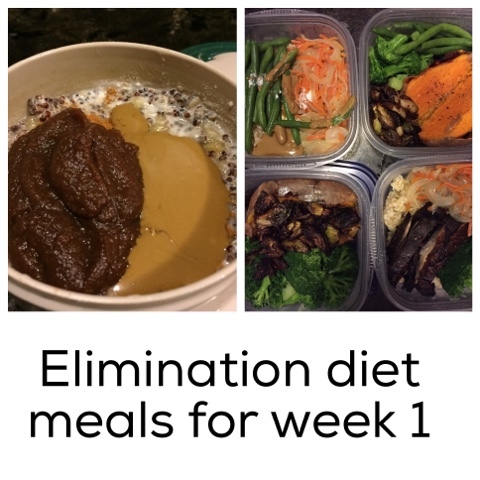 Two days with roasted sweet potatoes and veggies; two days with brown rice bowls and veggies - one is curry bowl, the other is an Italian style bowl with a grilled portabello mushroom. 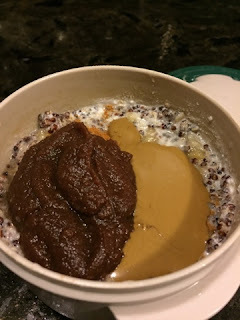 Breakfasts this week will be quinoa porridge with coconut milk, sunbutter, (unsweetened) applebutter and almonds with a banana or chopped apple. I'm also planning to make almond milk fruit and spinach smoothies with flax seeds. Passover is next week, making lunches trickier, as I'll have to omit the brown rice from my breakfast and lunches that I take to work. Lots more soups and veggie stews for me. Rinse the red quinoa in a fine mesh strainer under cold running water. Set aside. In a 3 quart sauce pot, bring the 2 cups of cold water to boil. Add in the rinsed quinoa, salt, vanilla extract, cinnamon stick, cloves and candied ginger. Bring the mixture to boil then reduce down the heat to low and cover the pot. Simmer the quinoa for up to 30 minutes, or until most of the water is absorbed. Remove from heat; keep the quinoa covered and set aside to finish cooking and absorbing the cooking water, about 10-15 minutes more. Fluff the quinoa with a fork and remove the cinnamon stick, ginger and cloves. I ate my quinoa with a 1/4 cup of coconut milk, a mashed banana, 2 tablespoons of pure, unsweetened applebutter, a tablespoon of sunbutter and some ground cinnamon. On other days I plan to add in chopped apples and sunbutter; chopped nuts, fruit and coconut milk. There are lots of options to make this breakfast porridge. Almond milk, other fresh or frozen chopped fruits; nuts; nut butters.